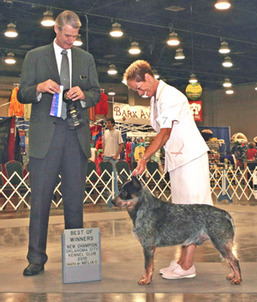 REDFOOT KENNELS Located in Tulsa, Oklahoma by Frieda Young. Frieda's dogs are all fully tested for PRA, hips and hearing. She has several imports of the Kombinalong & Turrella lines. Check out her website, contact info is on her home page. Pictured is her import AUS CH, AM CH KOMBINALONG OO SUPER "JAMES"
Please take a look if you are looking for a cattle dog, able to offer help or finances or ready to volunteer to be a foster home for those displaced dogs needing someone to help them until their forever home comes along.